The prospect of open heart surgery brings obviously a lot of questions and fears about what to expect. Find listed below the most common questions and concerns asked by our patients and their families, with answers provided by Dr. Ciuffo. How big is the scar after a minimally invasive operation? A minimally invasive heart surgery expert can perform the operation through a 2″ long incision. This tiny scar is often completely hidden in the skin fold underneath the right breast and looks pretty much the same as a plastic surgery breast augmentation scar. It will be invisible no matter what you wear! What’s a Minithoracotomy? It is a 2″ incision carried out between two ribs on the side of the chest. We don’t use ANY bone cutting or incision in the middle of the chest. This approach allows excellent access to the heart valves and coronary arteries to perform minimally invasive heart operations with great safety and accuracy. What long lasting local anesthetic do you use in the spaces between the ribs above and below mini incision? And what is the technique of the injection (volume, depth of the injection)? I use Marcaine. I inject about 5 cc in each intercostal space, aiming to soak up the intercostal nerve. I infiltrate two spaces above the thoracotomy, the thoracotomy space itself and two spaces below it to achieve effective pain control. This routine allows patients to get an early extubation and recovery, even in the very elderly and frail. What’s Osteoporosis? It is a condition that makes your bones very brittle because of a low calcium level. It is very common in postmenopausal women. It can negatively affect the ability to heal a split breast bone after traditional open heart surgery. This problem is completely avoided when a minithoracotomy is used instead of a median sternotomy. Which specific operations can be performed through a minimally invasive incision? We routinely use these techniques for almost everything that is commonly treated with Heart Surgery, including Aortic, Mitral and Tricuspid Valve repairs or replacements, Atrial Septal Defect Repairs, Ventricular Septal Defect Repairs, Redo operations, Maze Procedures, coronary bypass, atrial myxomas, intracardiac tumors, placement of biventricular pacemaker leads, ligation of coronary aneurysms and fistulas, excision of extracardiac tumors. If your doctor is not familiar with these advanced techniques, you should seriously consider consulting with a reputable Minimally Invasive Heart Surgery Center. Am I a suitable candidate for a Minimally Invasive Procedure? Maybe! This decision can only be made after a thorough evaluation. Dr. Ciuffo personally evaluates and examines each patient to determine if a minimally invasive procedure is indicated and feasible. How long is the recovery after this type of surgery? Most patients are back on their feet in less than 24 hours and are discharged home in two days. This recovery is a lot faster and affords a much higher comfort level than surgery performed through a sternotomy (splitting of the breast bone). I normally recommend one or two weeks of rest before resuming full physical and work activity. How much pain do you feel after surgery? Very little!! A minithoracotomy wound is so small that it can be completely numbed up with local anesthetic agents. Most minimally invasive surgery patients wake up groggy but absolutely pain free and can comfortably get out of bed the same day. Is there any good alternative to surgery for a severely leaky or clogged up valve? No, there isn’t! These are permanent mechanical malfunctions that can only get worse with time. They require a very precise surgical correction to give our patients a reliable and permanent solution to their problem. Can I wait or do I have to do it right away? Every case is different and should be discussed with an expert minimally invasive heart surgeon. If you have a severe valve leakage or stenosis and symptoms you are much better off with an early valve operation. 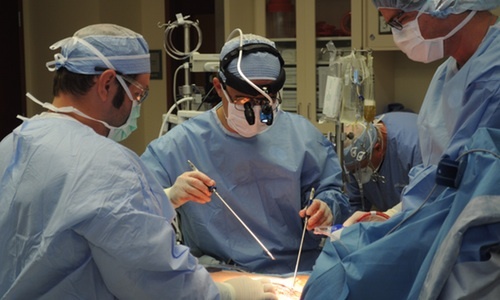 Can minimally invasive surgery be used in reoperations? Yes. These techniques have been applied in redo operations. Each patient, though, needs to be evaluated individually to see if he or she is a suitable candidate. What happens if I don’t get the surgery? The heart will progressively and irreversibly enlarge and your symptoms will increase in severity with the onset of congestive heart failure, water in your lungs, leg swelling and profound shortness of breath and weakness. Your heart rhythm will often become irregular (atrial fibrillation) and require blood thinners to help prevent strokes. In other words, it is not a good idea: you won’t live as long OR as well as a patient who had a successful valve operation. I live far from your Heart Surgery Center. How soon can I travel back home after a Minimally Invasive Heart Surgery procedure? What about lodgings? I see a growing number of patients who come from other states to enjoy the benefits of a minimally invasive and/or bloodless heart surgery option. The Akron-Canton airport is only ten minutes away from our center. The area is also easily reached by AMTRAK trains and by car. Patients are often ready to fly or drive back home shortly after their discharge from the hospital. My office assistants are very knowledgeable about local hotels and lodging solutions with hospital discount rates for our out of town patients. Do not hesitate to call and we will be able to help you coordinate your stay. Please note that every heart surgery patient treated in our center is accommodated in a private room at no extra cost with a convertible sofa available for a friend or a relative to stay overnight if they wish to do so. Most patients are allowed to travel back home within a week. I personally examine each patient prior to giving my final “blessing” for the flight back home. Is any home care available after surgery? We arrange a Visiting Nurse Service and home physical therapy for most of our patients. Each patient is instructed to call me directly for any post-op questions or comments. I have severe MR but I feel fine. Should I wait until I have symptoms (shortness of breath, leg swelling, chest discomfort, palpitations)? If you have severe MR it is definitely time to be seen by a heart surgeon for a thorough evaluation. Mitral valve repair techniques have a safe and reliable track record and early repairs are being recommended if an expert surgeon is available to confidently repair rather than replace the mitral valve. An early intervention can prevent the onset of atrial fibrillation and heart enlargement. It also improves the chances to get a good mitral valve repair and avoid serious cardiac events (i.e. : sudden death, strokes) associated to untreated severe MR.
How risky is a mitral valve repair operation? In experienced hands an elective mitral valve repair carries a risk of less than 1%. Can a leaky mitral valve be repaired RATHER THAN replaced with an artificial valve? An expert mitral valve surgeon can repair a leaky mitral valve in over 95% of the cases. Always insist on a repair. It is a much better option. If your doctor does not have the necessary expertise, consider consulting an expert mitral valve surgeon. Nowadays quite a number of patients take the initiative to travel out of town to get a good valve repair…definitely worth it!! Can a mitral valve be repaired/replaced with minimally invasive techniques? Yes, a lateral minithoracotomy is an excellent approach to operate on the mitral valve. It actually affords a superior exposure and visualization of the surgical field. A repair or replacement can be carried out with great safety and precision. The scar can be hidden in the skin fold underneath the breast. Can a DOUBLE VALVE operation be performed with minimally invasive techniques? Yes, each patient needs to be individually evaluated prior to making a decision on the type of surgery but double and even triple valve operations can often be performed with minimally invasive techniques. I have Mitral Valve Prolapse (MVP). Do I need an operation? Not every patient with MVP needs an operation but a cardiology evaluation with echocardiographic exams at regular intervals should be set up. That would help identify the MVP patients who develop a leakage over time severe enough to warrant a surgical intervention. My mother had mitral valve disease. Does it run in families? It occasionally does but it is much more commonly a random finding. Please note that MVP is very common in women. If we examine a sample of the general female population between the ages of 25 and 40 we would find that 1 woman out of 6 has MVP. Isn’t an Aortic Valve Replacement too dangerous in my frail 80 year old mother? Absolutely not! It is actually a true life saver with great improvements in quality of life and longevity. Don’t lose sight of an obvious reality: severe aortic stenosis is a guaranteed killer. The operation is the solution, NOT the problem!! Minimally invasive techniques allow a fast recovery even in elderly frail patients who are often out of bed and walking the day after surgery. I have aortic valve endocarditis with severe aortic insuffuciency. Can it be be treated through a minimally invasive approach? Yes. Additional preoperative imaging studies will be helpful to assess the aortic root and rule out the presence of an abscess. I have severe aortic stenosis (AS) and I get tired and short of breath very easily. How long can I postpone my surgery? You should not postpone it at all! Once the aortic stenosis is severe and symptomatic an aortic valve replacement should be carried out without delay to prevent a significant chance of serious cardiac events, including sudden death. Should I get a mechanical or a biological valve? There are pros and cons with each valve. I was told I need an aortic valve replacement. I want to have it done without the usual cutting of the chest open. I would like to have Transcather Heart Valve replacement (thv). Thank you for your comment. I’ll soon publish a webpage on this subject to help patients like yourself read through the confusing and often misleading information out there in the internet. THV is not approved by the FDA for treatment of aortic valve stenosis unless patients are a very high and prohibitive risk for a surgical AVR. There are good reasons for this restriction. Please understand that a surgical AVR is a much better and safer therapy than THV. Most aortic stenosis patients in this country are treated surgically because of the following reasons:1. THV carries a risk of stroke that is four times higher than surgical AVR. For this reason, I do not know of any heart surgeon in good faith who would choose a THV rather than a surgical AVR for himself.2. There is no guarantee that the THV valve will last as long as the bioprosthetic valves currently used in surgical AVR. There are not sufficient follow up data to support that.3. THV has a much higher incidence of perivalvular leak (a leak between the THV valve and the implant site). On the other hand, this problem is exceedingly rare in surgical AVR’s4. If the groin arteries are small or heavily calcified, the risk of serious injuries when the THV catheter is deployed through them is high. A small femoral artery is actually a contraindication to THV5. THV has a higher mortality rate when compared to surgical AVR.The idea to fix a valve with a catheter intervention sounds indeed attractive but it is definitely not the best option in most patients. The best current option in 2013 is a minimally invasive AVR through a 2′ incision on the side of the chest in between the ribs, without breaking any bone, similar to the technique described in my website. This the safest least invasive and more definitive treatment available for aortic stenosis. Most patients are still discharged home in the same or less time it would take to send an uncomplicated THV patient home. I hope this answers your comments. I do not have any specific clinical information about your case but I would advise you to discuss your care with your doctors to decide what is best for you. Please feel free to contact me if I can help you with more information. Can minimally invasive surgery be carried out in patients who need multiple coronary bypasses? Yes. We have had a tremendous improvement on what can be done in coronary surgery. Years ago the only minimally invasive option was a MIDCAB which could only be offered to patients who needed a bypass to the front of the heart (LAD or Diagonal branches). Today we can routinely offer a MICS CABG through the same minithoracotomy. This advanced operation can now accomplish the same grafting strategies that up to a few years ago were only possible through an old-fashioned breast bone split. I have been told that I have a very weak heart with a low Ejection Fraction. Am I a candidate for an off pump coronary artery bypass? Beating heart surgery techniques can be applied in the vast majority of coronary patients, including low Ejection Fraction patients. If you have concerning symptoms or you know that you have coronary, aortic or mitral valve disease it is time to start looking for a good minimally invasive heart surgery center to discuss your best options to restore your normal life style and life expectancy. If there is no expertise in this type of repairs and surgery in your region, it is well worth a trip out of town to have these options available. Visit Dr. Ciuffo in York, PA for a second opinion and an evaluation of your condition and ability to have surgery. Contact us online or give Dr. Ciuffo a call at (717) 851-6454. It’s your heart, it’s your body, it’s your life! Have Your Own Questions? Contact Us!